New Icons celebrates the stories behind particularly notable pieces from this season. The big, blunt lines of brutalism are dominating modern design. And now in everyday life, we find ourselves being gravitationally attracted to the presence of weight and bulk. This can be seen in our increasingly modular cars, that look forced rather than sculpted into existence, or in rough-hewn spaces like the new Tate Modern building where you can consume art safely within its bunker-like brickwork. But beyond these snub-nosed hatchbacks and concrete monoliths, Alexander McQueen’s platform sneakers for men and women indicate how the same stripped-back supersizing loved by brutalists is inspiring shoes. Rooted in anti-romanticism, this is the label you would expect to see plumbing the depths of power in search of elegance. Platform sneakers are an established item for women, yet they still feel unexpected for men. This only adds to their appeal, of course. The historical irony is that youth culture's legions of angry young men have spent decades stomping around in creepers, combat boots, and other ultra-masculine footwear defined by heavy-duty soles. 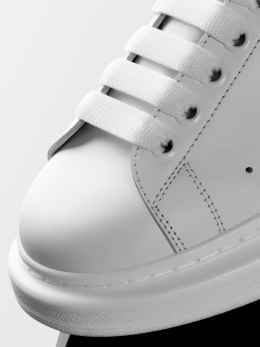 Alexander McQueen’s take on this motif is a shoe for moshing laced into the context of elegant lunchtime simplicity. The shoe pairs maxed-out proportions with the minimal styling of popular brands such as Common Projects and adidas Originals. The only concessions to decoration are one line of perforations, gold logos on the padded tongue, and a black heel panel. The sole here is the real star, stacked and widened to emphasize its rounded shape, bulking up a simple tennis silhouette with added height and muscle. It stamps creative director Sarah Burton’s authority on her predecessor’s legacy by showcasing her ability transform the brutal into something uncanny. Like she once told journalist Susannah Frankel, while discussing the doctrine for her designs after taking over at McQueen, “Empowerment and protection: Working here, you always have to bring it back to Alexander."